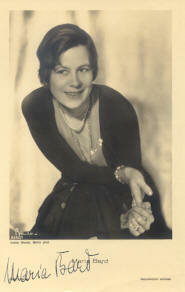 The actress Maria Bard was a inveterated theater actress who made a great career on the stage. Befre her career as an actress she worked as a piano teacher and pianist. Already at the age of 20 she got married with Wilhelm Graaff who financed her acting education. Wilhem Graaff founded the film company Rimax in 1923 which not only produced promotional films but also feature movies with Maria Bard. Nevertheless Maria Bard only appeared seldom in front of the camera, she normally paid attention to the theater. To her early movies belong "Berlin - Alexanderplatz" (31) and "Mensch ohne Namen" (32). In the National Socialist Germany she took part in well-known movies like "Premiere" (36), "Kapriolen" (36), "Kleine Mädchen - grosse Sorgen" (41) and "G.P.U." (42). Maria Bard was also married with the famous actor Werner Krauss. To this marriage went ahead a drama. The married Werner Krauss and Maria Bard played such a daring loveplay on stage in the play "Der Kaiser von Amerika" in 1930, that their relation behind stage became obvious. The wife of Werner Krauss who was sitting in the audience went home after that and committed suicide. Werner Krauss and Maria Bard got married the next year. Maria Bard was also married with the actor Hannes Stelzer. She committed suicide in 1944 because of private and political reasons.